I came back from the trip very satisfied. Hereby please find some comments about the trip, hope I have covered every aspect. The lodging is very simple, I highlight the comfort of the beds and the personnel service, they change the sheets every day and the cleaning is well done. The bathroom is basic as well, and the water is only for bath use, you must not drink it nor wash your teeth with it, bottled water is available in every room for this purpose. All rooms have AC but if you open the window at night there's a great breeze coming in, which I found very pleasant. Electricity is turned on once you get back from fishing, so if for any reason someone stays at the lodge or arrives earlier they'll have to tell the staff. The same with the water. As for the gastronomy, the amenities are very primitive nevertheless I have congratulate them for the amazing job they did and effort they put with the scarce elements they have. 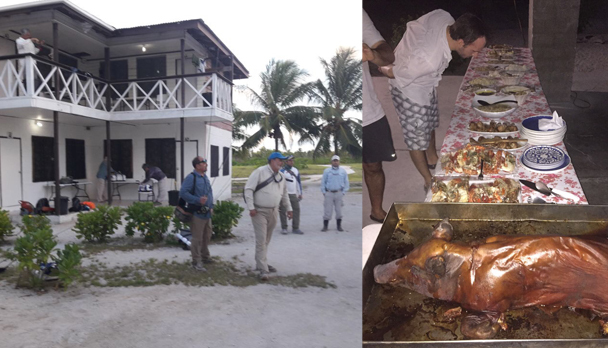 We've eaten fresh octopus, taken from the beach in front of the lodge, lobster, tuna, red snapper, sashimi every day, chicken and pork with rice, smashed potato and salads as side dishes. Fruits, mango and desserts every day. To be honest, it's a privilege to be able to enjoy such dishes despite the poverty of the island! The beverages are sodas and beers, but if you want alcoholic drinks then you?ll have to get them yourself. There are some local markets. The breakfast is fine and abundant, and the lunchbox for midday has 2 sandwiches which were enough for me. All the snacks I carried with me I never ate them and gave them to the guides and lodge staff. The fishing operation was something new to me, since it was different from the other saltwater experiences I had. They wake you up at 5 am, breakfast is served at 6 and at 7 the guides arrive in their truck vehicle to take you to the small marine were the boats are waiting. I enjoyed the truck trip because you can appreciate the rest of the island and see how locals live. Each boat carries 4 anglers, 2 guides and 1 captain. 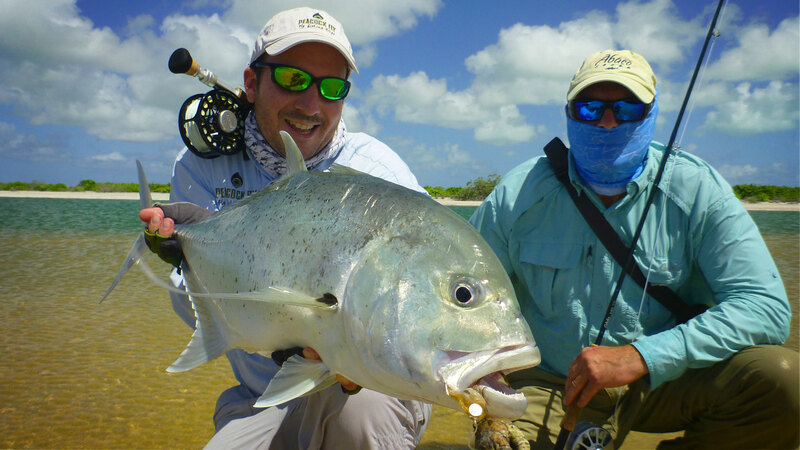 Each guide chooses a different flat to fish, the wading is not particularly easy since the bottom has seashell and after 2 to 3 hours of wading you can get physically tired. Some guides and boats have radio and others don't which I find not very handful for any inconvenient or emergency that might occur. Those guides who don't have radio, communicate with the boat by lifting their arms... and it's a while until the boat arrives to the anglers. If there's someone who had an accident or doesn't feel well, this might not be a pleasant wait, which can be solved easily with a radio. We were lucky and didn't have any inconvenient. The head guide Bita, is quite calm and laid back, in my opinion his presence could have been more frequent. 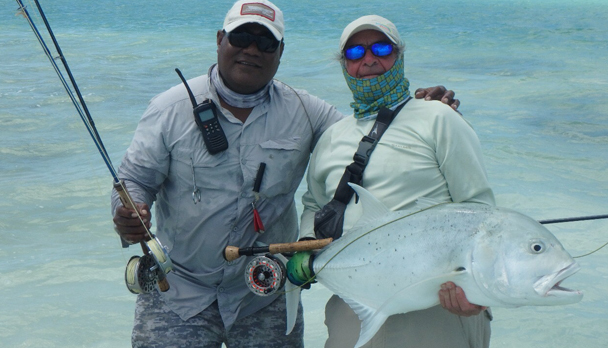 Besides the initial talk, which in particular didn't add more to what we already knew, he dropped by every night to write in a board the next day's fishing couple, guide assigned and captain. In my opinion he should be in the lodge at 7am checking everything is on time and check after any angler's need or concern. He's a very good man and easy going, which might seem easy for other guides to jump him over. We had an experience one day, that we wanted to fish in a specific place, the Backcountry, that's far away so we were recommended to depart early in the morning. We agreed with the guides about that and the next morning they were all late and said we couldn't go there because it was too late to depart... and Bita wasn't there to assist us. I wasn't very affected by this situation, but indeed wanted to fish there because we were told that many GT gathered there due to the big amount of food in the zone. The guides in general are quiet and respectful, and if you shoe them interest in talking about their island, people and traditions they come more friendly and can offer a gentle conversation. I had 2 very good guides, Iliu and John, both very educated and very good guides. The other guides weren't much different but these 2 I must highlight. I dedicated some time in learning some word of their language, I practiced with Kikibon the girl from the bar. I enjoy doing this in order to establish a better relation with the guide and make him understand they way I like fishing. For me it was a nice experience, both in the fishing aspect, even though it wasn't much, and getting to know how the island people live? the seem very happy.